yes to greenhouse gas emissions check and no to emissions caps", reads China's National Climate Change Programme issued on June 4. In what is being called as the first national climate change plan, China has said climate change is the fallout of massive co2 emissions from developed countries and has asked for international cooperation. Instead of accepting mandatory emissions reductions, China clarified that it will rather encourage energy efficiency, energy conservation, clean power development and forestation to meet the target to reduce energy consumption by 20 per cent by 2010. Meanwhile, Ma Kai, minister of the Chinese National Development and Reform Commission, watered down demands by Western countries to accept an emissions cap by calling it "too early, too abrupt and too blunt".Economic growth and eradicating poverty are the important tasks and the international society should respect China's 'development right', Kai said. 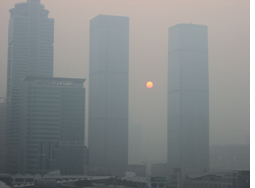 China has been blamed for greenhouse gas emissions because of its high dependency on coal. In 2005, about 69 per cent of China's primary energy consumption was coal, while the world average was about 28 per cent. China has recognised that reducing dependency on coal is its biggest challenge, which finds a mention in the plan. The plan outlines a wide range of measures, including promoting low-emission and high-yield rice varieties, improved irrigation techniques and reinforcing management of animal and solid wastes to control methane emissions. Experts believe China will face much more difficulties than other countries in decreasing its carbon emission per unit of energy use. The reasons they outline are limitation in use of other energy resources and energy efficiency improvement being subject to availability of advanced technologies and financial resources. To overcome the financial burden, however, China intends to use its clean development mechanism fund to implement the plan. The government levies a certain proportion of its certified emissions reductions transfer benefits from clean development mechanism projects. The revenue collected from it is used to establish the clean development mechanism fund.